Dmitri Shostakovich, born and raised in St. Petersburg, studied at its fabled Conservatory in the aftermath of World War I and the Russian Revolutions of 1917. His teachers there included Leonid Nikolayev (piano) and Maximilian Steinberg (composition). With the premiere of his graduation piece, the First Symphony, in 1926, Shostakovich's exceptional career was launched. He quickly established himself at the forefront of young Soviet composers. Shostakovich was fortunate in attracting some of the most gifted performers of the era — Yevgeny Mravinsky, David Oistrakh, and Mstislav Rostropovich among them — as ardent champions of his music. In his last years, he turned increasingly from large-scale "public" works to music of confessional intimacy, concentrating on the genre of string quartet and vocal music. 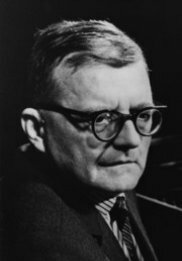 A highly politicized figure during his lifetime and since — because of a high-profile career carved out in the conditions of Communist dictatorship coupled with the immense emotive power of his music — by the time of his widely-celebrated centennial in 2006 Shostakovich was hailed by common consensus as one of the greatest twentieth-century composers. A substantial body of his large and varied musical output has established itself firmly in the standard repertory.